You don’t have to wait for your leaders to self-actualize to increase trust and reduce fear. At TANDBERG, people hit the empowerment gym for a regular workout of the “Player” muscle. When “Player” is strong, fear and hierarchy tend to stay low. MIX Mavericks have put strong stakes in the ground on the topic of trust: John Mackey says you can’t build high trust organizations without love, Raj Sisodia says we should conceive of leadership as trusteeship. In both cases, we need—to use John Mackey’s words—self-actualized human beings to pull it off. The trouble with self-actualization is that it rarely happens overnight. More often than not, it’s a painstakingly long process that can take years or even decades depending on the individual’s starting position, the nature of the “slings & arrows” life throws his way and on the cognitive technologies he uses (if any). So what can be done right now in organizations that don’t have an enlightened leader like John Mackey at the helm? This is a story about an attempt to maintain trust and entrepreneurial spirit and reverse a premature onset of fear in a fast growing high-tech company. Increasing trust and reducing fear is rarely on the agenda in young companies where everyone knows each other, most people are friends, titles don’t mean much and decisions are made on the fly by people who have a valuable perspective to contribute. But things get trickier as companies grow. In the early 2000s, TANDBERG was fewer than 500 people and adding hundreds of new people every year (now the world’s leading manufacturer of telepresence and business video equipment – see another story “Soft R&D” for more background on the company). The company was in need of what most people inside it openly resented—organization, structure, processes. The first attempt to inject them led to a full-body rejection: The Board hired a professional CEO from a high tech company well regarded for it efficiency and effectiveness. As per his mandate, the new CEO focused on professionalizing the business and installed a clear chain of command (and control). A dramatic decay in trust started with the introduction of rigid decision making process that excluded people who were accustomed to being involved. As decisions were cascaded down the line, stripped bare of the discussions and reasons that led to them, they were triggering snowballs of subtle resistance. Fortunately, the desire to get back the “old” culture turned out to be stronger than the fear of speaking up. The CEO—despite his many useful contributions—did not stay in his role for long. The CEO was gone but many new and old issues remained in the now 1,000+ organization. It was no longer possible for everybody to know everybody. Departmental boundaries were starting to calcify into silos that stopped people from asking questions outside the scope of their responsibility. Blaming was starting to rear its ugly head. It was all starting to add up to a slight but noticeable decline in the entrepreneurial spirit that powered the company since its conception. And that was the management’s biggest fear. Something needed to be done but what? Can you keep the organization flat and bubbling with entrepreneurial spirit, yet running like a well-oiled, effective and efficient machine? Can you keep your cake, and eat it, too? One thing people at TANDBERG learned from selling technology is that technology alone is a necessary but often insufficient solution to make a real difference. You can have the best personal telepresence system on your desk or the best web 2.0 technology enabling your organization—that’s a great start but what people do with it and why will determine the mileage the organization will get out of that technology. Everybody at TANDBERG had access to video and could call up anybody inside TANDBERG at any time and from any place for a face-to-face conversation (presumably the best setup for a trust building conversation). But what would make people call up anybody, especially if that anybody is in another department, a person they have not met before or a person who happens to be an executive? How organization is structured, how decisions are made, who the executives are—all of these things matter but so does what every person in the organization makes of these aspects of the organization. Do they judge it, decide it’s not their responsibility to fix things that are outside their responsibility and turn into the disgruntled and the disengaged? The big idea was to find a practical tool that could give every employee inside the company, including the management team, the language and the way to develop a different attitude to whatever was going on inside the company, a la “This is wrong or could be better and I am going to fix it even if it’s outside my responsibility.” We wanted nothing short of unconditional responsibility. From everyone. When a new hire joins TANDBERG, they are first introduced to the Player mindset during the New Hire Workshop. That’s Player mindset for beginners. They learn to differentiate between Player and Victim first by sifting through dozens of statements picked out of real-life conversations that have happened inside TANDBERG (e.g., “I was not involved in this decision, so what do you want me to do?” “Of course we should get lower targets—we are in the middle of the recession!” “I don’t have time for this.”) Once they sort them into Player and Victim, they try to flex their own Player muscles by attempting to convert Victim statements into Player statements. It’s never as easy as it first seems. All “soft R&D” Labs (see “Soft R&D” story on the MIX) have an advanced version of the Player workout with content tailor made for the role. Leaders tend to get the most difficult work outs. Many large and small group interactions contain some version of a workout with the most up to date Victim content. This way people get to flex their muscles on the most pressing issues of the day. As a result, everyone at TANDBERG has been through several Player workouts. With time, practice and encouragement, Player develops into a default mindset. For dramatic effect, the Player workout was initially introduced in black and white terms. Being a Player was obviously good and being a Victim was obviously bad. Things got less obvious as time went on. The culture of strong Players evolved to mean that under no circumstances it was acceptable to be a Victim, even for a moment or in the moment. But what about those cases where somebody has a valid point but cannot find a good way to transform their insight into the language of a Player in the moment and chooses to not share his or her perspective? The culture of strong Players produced a new form of fear, a fear of being perceived as a Victim. The distinction between Player and Victim needed to be more subtle, especially as TANDBERG was headed for the emotionally turbulent waters of integrating into Cisco after Cisco acquired the company in April 2010. A safe place needed to be created for the Victim to be a Victim, to let out the emotional charge before being able to transform one’s thoughts into the language of Player. Sometimes it was not even possible for some people to do it on their own without external help. That’s why the cult of the Player needed to be toned down with the idea that Victims are rarely without cause. As a Player, one has the unconditional responsibility to seek out the wisdom in the Victim’s complaint. Player mindset and workouts designed to develop it are practical ways to build self-empowerment. Leaders can do a lot to increase trust and reduce fear but so can the employees. When both sides take on unconditional responsibility, they start a positive feedback loop. Although TANDBERG’s organization is far from perfect and is always a work-in-progress, they have to a large extent managed to keep their cake, and eat it, too. They kept a fairly flat organizational structure without losing speed. People do call up the CEO, and the other way round. And when leaders “misbehave,” it’s perceived as a call for some Player action, rather than the call to join the Disengaged and the Disempowered. Player mindset is easy to introduce and the introduction does not need to happen top down. In the early days of the introduction of Player mindset at TANDBERG, many new hires were heading back into teams that had never heard of Player mindset and were running some version of Cynics-Who-Lunch clubs. It was part of their mission not to join in, no matter what the manager was like, and to convert the club members into Players. Most new hires were happy to oblige and did with surprising amount of energy and commitment. Original language and frame of Player vs Victim: Fred Kofman's "Conscious Business"
Great discussion here Erica and all. It's sad that there has to be a victim in order to champion a player, and it makes me wonder how we could redesign the game so that does not have to be so. Competition, as we too often craft it, makes one side play games against another side that stomp innovation's growth for entire organizations. My question is: How can we design a way for whole teams and whole organizations to win - based on how we increase trust through measures we use in feedbacks? What do you think? I guess I frame it differently in my mind. I don't see it as "there has to be a victim in order to champion a player." To me, Player vs Victim is about what people make of the circumstances they find themselves in. So, it's mostly about how different individuals relate to their reality. "Victim" is not necessarily a pathology in my mind as long as it does not calcify into a default outlook on life. There are things outside our control, things don't always go as we plan, etc etc. There are plenty of situations where people can feel victim to circumstances for very good reasons. The question for me is, once you have those feelings, what's your next step? I think Player is a helpful next step. What I love most about this great story is the part about your adjustment, and seeing that there was a need to find the wisdom of the victim. That shows that this was truly a "double-loop" process when you found that you could have inadvertently fed the shadow side of the player mindset. Instead, you opted for integration and inclusion, affording both players and victims a way to find a place for their experiences and desires. This is an articulate and savvy approach to culture change and something for many of us who are in the field to learn from. Thanks so much for sharing this inspiring and practical approach. Lots to think about here! It's neat that what stood out to you was the adjustment we had to make in how we were relating to the Victim. I also think it was key. Without it, we would have gone down the doomed road of outlawing any negative emotion at work - a goldmine for organizational transformation! Erika, One more comment as have been thinking further. I think one of the things that causes people to become disengaged is not having the power to do anything to improve things even though they have ideas on what to do. The beauty about what you wrote about is that not only do you educate people about "victim/player" mindsets, they are also given the ability/permission to act on their improvement ideas. So I am thinking that is truly the key combination to having a company that is full of "players". (i.e., education + ability to act). I think that not having autonomy is one of the key root causes of disengagement and dissatisfaction and promotes the victim mentality. That said - what do you think? Do you have a different view? What you wrote definitely resonates with me! I am just not sure *who* gives the permission at the end of the day, to what extent a third party can empower you? The way I see it, it's rarely black and white. From an individual employee's perspective, there are always the facts of your role and then there are the interpretations you give to those facts. Few people have roles that do not allow them to do anything. If there is a role, it means there is something you are supposed to do. Now, how do you interpret the boundaries of your role? Do you feel you have plenty of autonomy to do what you want or do you feel the role constrains you? Different people would have different interpretations on the exact same roles. One person feels fully empowered and engaged. Another disengages and grows bitter. Sometimes, adjusting the boundary of the role is the cure for disengagement. Sometimes a mindset shift alone can produce the feeling of being empowerment. So, I hesitate to resolutely say that not having autonomy is one of the key root causes of disengagement. I have seen so many people making very different stories about very similar situations. The siren call of a Victim is strong - it's easier to blame external circumstances (your boss, organization's size or structure, unfavorable economic environment) for your misfortunes. What we tried to do with Player is to introduce the antidote to that, get people into the habit of asking whether they can change their circumstances, and if they could not, how they could make the best of the givens - because whining is just not helpful. Generous granting of autonomy can be great in some circumstances and disastrous in others. I like to make these calls based on understanding the people I am dealing with, rather than having a preconceived idea. Fantastic article! Loved it! In the business unit I am working with we have leveraged tools that came available through our corporate office to connect our remote teams. We don't yet have video capability, but I have been saying we need it as had same feeling that your article so excellently describes - we are social creatures and there is something to be said for being able to see another person. 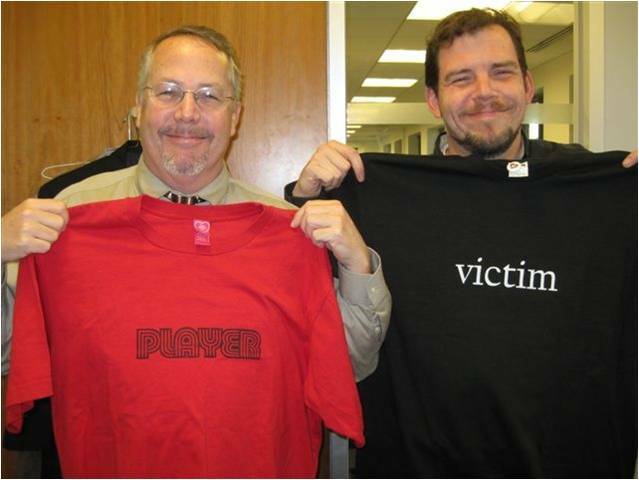 I also have long hated the "victim" mentality on both a personal and professional level. I never thought about doing what you did to highlight the differences between a "player" and "victim" viewpoint. So how long timewise are these exercises that you created? Also, you mentioned that there are different levels? Any tips you would have for me would be SO great! Lastly, I loved your article for the fact that I have been thinking about how to sustain this culture even if leadership should change. So thanks for sharing as you now have me thinking more on what I could recommend so that no matter what this org structure and culture we have put in place can not only survive, but thrive. If you are curious about what I am up to...check out my article. I just posted it on the 15th. It is called "Blowing up the 20th century mgmt model". P.S. Excellent YouTube as well. Thx for including it! To answer your question about the length of exercises - we developed many different formats, from several hour long interventions to quick real-time interventions in meetings. For beginners, we would have a brief intro to the basic concept, a few third party situations where people would have a go at transforming "Victim language" into "Player language." Once people are warmed up, we would move into working with the actual situations people find themselves in at the time. The most important tip I think from what we have learned is to always do context specific content. What it means in practice is that you have to have your finger on what is going in the organization right now, what the key "Victim" themes are current and work directly with that. E.g., the recession hits and people tend to fall into a mindset where they feel victim to their circumstances (e.g., "I cannot make my numbers in this economic climate. People have frozen their IT budgets - there is nothing I can do.") We would go right after that, help people explore what it means to adapt the Player mindset in relationship to this specific situation. I will definitely read and comment on your contribution. Although it may sound simple, building organizational capability on a few explicit behaviors and mindsets such as "player", it takes hard work, reinforcement and time. It takes explicit management ownership and rolemodeling as well. For TANDBERG, the return of this investment was high: this mindset became a key competitive advantage that drove high revenues, speed, growth, employee engagemnent, and last but not least contributed to TANDBERG winning "Great Place to Work" several years in a row. Erika, thanks for the compelling story of technology and inferences for where it may be headed related to business in future. Like other Mixers - I was keenly interested in the relation between trust and increased technology. I'd love to hear a bit more about your statement, "My formula for building organizational trust would therefore always be technology+org development.."
I am not sure what aspect of my statement you are interested in. So, I will just elaborate a bit and you can ask me a more specific question. What I meant to say by "technology+org development" is that I personally would not rely on technology alone to magically produce trust - at least in the context of video, web 3.0 and social networking platforms. I prefer to consider the current state of the organizational culture and practices and design a change in mindsets & cultural norms needed to make the most out of the new collaboration opportunities offered by new technology. Collaboration technology can rapidly amplify pre-existing cultural conditions and behavioral norms. It's wonderful if people in the organization are already talking to each other, already trusting each other, are already used to thinking and creating together. But it can get pretty ugly fast if that's not the case, then people would just have more channels and fora for airing grievances to third parties, building communities of misery, etc. Or even worse - from a technology vendor's point of view, obviously:-) - not use the new technology. Does that answer your question? Or are you interested in something more specific? Ross, sorry for a delayed response! Although video or telepresence technology has little to do with my story in a sense that it was a "pre-existing condition" at TANDBERG, your question about the impact of video communications technology on trust is a very good one. Most people who try business quality video quickly turn into video evangelists. "Once you try video, you never go back." I am no exception. The logic is simple: We humans have been perfectly fine-tuned for face-to-face communication over the last 100,000 years. We have invented all other forms of communication only recently, not enough time for the biological evolution to kick in. Video is the next best thing after face-to-face. When two people interact over video, they exchange almost as much information as in face-to-face interactions (well, you do miss out on the shared sense of space, felt sense of presence, kinesthetic interaction which can prove to be critical depending on the purpose of the interaction). And that's where - at least in my mind - the role of video in building trust stops. Video will give you more information. It won't automatically produce trust because trust is an inter-personal phenomenon, not a technological one. It depends on how people interpret the visual clues that they get and what they do about those clues. So, I would absolutely video-enable all organizations out there - that's what Cisco is now working on. I just would not automatically expect trust to be the byproduct. Just like with any face-to-face interaction - just because two people are in the same room, it won't automatically mean they will trust each other. My formula for building organizational trust would therefore always be technology+org development. This is a great article - thank you for writing.... It sounds like the transition to a larger organizaiton (and new CEO etc.) introduced policies and a hiearchy that led to exclusion - which eroded trust. Do you feel like your technology (video conferencing, anyone can contact anyone) could have (or did) help build stronger relationships or enabled greater inclusion? It seems that as video conferencing and communications technology advances that we could leverage those to build more trusting relationships - particularly across organizational and geographic boundaries. I would be curious as to your thoughts on the role that your video conferencing technology did - or could - play in building organizational trust. At the time, it was one of those "it's obviously what we need, so we will just do it" decisions. As different people and teams were getting introduced to the Player workout, the effect tended to be apparent to "Players" themselves and the people who worked with them. There wasn't really any compelling reason to invest time and effort into trying to isolate and track the impact of the Player mindset - the business was growing at double digits, people were happy and when they weren't, they did something about it. That what Player is about. Turnover was by far one of the lowest in the industry. TANDBERG managed to maintain a relatively flat organizational structure that was constantly changing. The Chief Cultural Officer remained true to her conviction to not create any org charts, so that people would not get a chance to get identified with boxes/titles and, instead, keep their identification with their team mission and Player mindset to figure out the best way to deliver on the team mission. Two years ago TANDBERG did start participating in "The Great Place to Work" survey and came out at the top of the best places to work list in Norway both times, last time despite the fact that people were answering the survey shortly after the announcement of the Cisco acquisition. Most people inside TANDBERG would agree that Player mindset had a role to play in this but unfortunately there is no hard data to back up this claim or attribute relative weight to it. Good story! Can you share whether or not this approach was effective? Did TANDBERG have to do anything else to restore its culture or was it the only thing it did? Do you have metrics in place showing the culture before and after?